The following post appeared in February on The Spirited Woman, where Andrea is a weekly blogger. We’re happy to report the pup you’ll read about here is now healthy and happy, living the life he deserves. For more on his story, see Flipper’s story: From baby knees to little husky prince. If I had to identify the emotion I’ve been feeling for the last 24 hours or so, I would label it passion. Oh never mind that it’s Valentine’s Day as I write this post…that’s not the kind of passion I’m referring to. I’m passionate about a cause, a need that touches my heart. Consider this story. 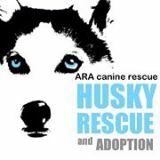 Right now there is a beautiful Siberian Husky pup being cared for by a Los Angeles area rescue group. He is a product of irresponsible breeding and was sold as a tiny pup to unsuspecting owners who were misled about his health. This precious angel was born without kneecaps in his back legs and needs very expensive surgery. With it, he can thrive. Without it, he will die. People from around the country are rallying to donate to his medical fund, and the angels from the rescue group are lovingly working with specialists to get him the best care. I love words, and writing gives me an opportunity to study them. Today, my word “passion,” describes the drive to action I have felt, and the deeper feeling underneath is “compassion.” I was surprised to learn that the Latin root of the word passion is “suffering.” Compassion’s root is “to suffer with.” Ah, the addition of the word “with”… connection. My drive to help this one dog could easily be snuffed out if I allowed myself to become overwhelmed by the great need beyond his. I’m reminded of the well-known starfish story in which a young girl’s refusal to be discouraged by the limitations of her own small efforts inspired others to join in and help. This is how connection works. We inspire one another. Last month in my post entitled Right Now, I talked about the critical importance of prioritizing what really matters and focusing on the task at hand. One’s health as well as success depends on it. I can relate to his challenge and I bet you can too. It’s so easy to allow ourselves to be pulled in multiple directions at once and become distracted by the ones that are the loudest or most compelling. The next morning I reflected on the question of how to determine the task at hand as I began my day. I decided to let my experience inform me hour by hour. I knew the first three hours of the day would be easy, as I had an extended session scheduled with a client. It was work I love to do, and work that requires the kind of focus that forces one to block out distractions, compartmentalize other pressing to-do’s, and be fully present. Plus, I had made a commitment to do it. After that meeting, I got to work on the other items I had promised myself or someone else that I would complete. Not everything on the list was as fulfilling as the work with my client, though each seemed as though they “had” to be done. I was reminded of a principle called Have-To versus Choose-To. It’s infinitely more empowering to choose than to be obligated. Commitments drive our calendars. Most of us follow through, at least eventually, on what we say we’ll do. The nagging question though (the real question the reader asked) is: What drives our commitments? What drives what we choose to do? When we’re fully conscious and aware, some greater strategic picture of life – purpose, values, potential – drives our choices. When we’re not, it’s dangerously easy to become distracted and rationalize “busy” as productive. In their new course “The 5 Choices,” time and productivity management experts at Franklin Covey say our attention is under attack. Their research shows that now more than ever we are reacting to distractions vs. choosing to spend our time on what’s important. In their extensive survey, people reported spending an average of 40% of their time on unimportant tasks. I’ve written before of the need to allow inspired, creative thinking to drive our deepest desires before jumping to action. I believe there’s never been a better time to ask and answer the question, “What’s important? After a day of observing myself, I was satisfied with the choices I made. But my project was skewed by the study itself. Awareness of the choices I made, coupled with focus on why I was making those choices was, for me, the success formula. I might be onto something…try it if you wish. This week, I’m having an adverse reaction to things that are “hard,” and so I’m practicing ease. This encore post seems appropriate today. It appeared originally on The Spirited Woman where I’m a weekly blogger. This summer, followers of this blog will enjoy bi-weekly archived posts that have appeared on The Spirited Woman but never before on this site. What we need are tools for escaping from the mental concept of “hard” when it bears down, eclipsing the beauty of right now. So how do we make being present “easy?” Many before me have written of and taught tools and techniques. I offer you mine in simple form. Breathe. Attention to the breath brings attention to the body. When we focus on (or obsess on) what happened before, we are literally out of our physical bodies and in our mental bodies. Practical tool: When you feel fear, anxiety, or guilt – take a breath, then another. Notice it. The result? Your attention will re-focus on now, if even for a second. Empathize. This one works if you can’t get clear on how you yourself are feeling in this very moment. How is a significant other experiencing it right now? Caution – it’s against the rules to consider what he or she thought or felt moments or days before. This is about now. Focus. I know this may be the hardest one…oops! There’s that word again. But really, it is the most liberating thing we can do. Stop right now and focus – ask yourself, “What is true now?” and really pay attention. I’m betting it’s not as bad as your mind might have conjured up. If it’s not, enjoy the break. If it is, then you just got a dose of reality to use to take remedial action. Now. Do what you can (not what you can’t). A friend reminded me of this piece of wisdom she learned in a workshop many years ago. I had told her that while I know that not looking back is a practice we all can manage, I do not know how to advise those who have suffered tragic losses. Who am I to suggest that they leave the past behind, if the past contained love and life that is literally not here today? What I realized is this. When one practices presence in small ways (staying focused amidst life’s small irritations, for example), the “big” things become easier because of habit, not because we worked on them specifically. We never lose the memories but we care for ourselves by experiencing them in the context of this very moment. Think about the ways in which you work to stay present in your daily lives. What do you do when “showing up” here and now is essential? If you have a practice for times like that, it can work at all times. An emerging theme this past week could be summed up in this sentence: “Show up and let yourself be seen and heard. There’s work to do.” So it seems fitting to share this post that appeared originally on The Spirited Woman where I’m a weekly blogger. For most of this year, I’ve been feeling like an Indigo Girl — closer to fine. Seriously, while I will seek to learn and thus grow until the day I die, my fifties (early fifties mind you), have freed me to admit I have gained some wisdom from the journey and am more or less comfortable with who I am. And this is why I was stunned when I discovered Brene Brown. A research professor at the University of Houston Graduate College of Social Work, she has spent the past decade studying vulnerability, courage, worthiness, and shame. Her 2010 TEDx Houston talk on the power of vulnerability is one of the most watched talks on TED.com, with over 6 million views. I am no more than a third of the way through Brown’s current book, New York Times bestseller, Daring Greatly: How the Courage to Be Vulnerable Transforms the Way We Live, Love, Parent, and Lead. Yet a few key sound bites have haunted me in the week since I downloaded the book to my Kindle. I’m not just “closer to fine.” I am fine, today. And tomorrow I have an opportunity to show up with even more courage and authenticity. Right now I am weary although joyful about the opportunity. Stay tuned for the stories. Earlier this week I was talking with a client about balancing the seemingly contradictory demands that create a significant amount of angst in a corporate leader’s life. In day-to-day practice, it’s really tough to make decisions for the good of the company when sometimes those decisions are not good for the business unit. It’s a challenge for executives to be involved and connected at all levels without usurping lower level managers’ autonomy. And, anyone who works in a for-profit business knows that at every turn, the delicate balance of delighting customers and maintaining profitability must be maintained. He cited Eckhart Tolle’s classic work The Power of Now, and we both agreed that Tolle might say there’s nothing good about ego. I told my client I saw ego as a separation from who we really are, and that “who we are” is not a unit but a part of a whole. In that way, no individual is ever separate from his or her corporate peer or competitors – we just think we are, and that’s the problem. There’s more though. As humans living on the earth, we are each a “self,” connected to all things visible and invisible, but still separate. If this human experience is the ego, the only way to rid ourselves of it completely is to no longer be here in form and that’s certainly not the answer for me or my client. But here’s the gem. The very moment we observe, rather than identify with, our egocentric “I-me-mine” thoughts and feelings, they dissipate. And our unique and grand selves can go about the work we signed up to do, making decisions that are sometimes imperfect but come from our best and highest self. From our hearts perhaps, not from our egos. For some time I’ve been writing that we must learn to lead with our hearts, and make decisions from a place of balance. Our heart provides the guidance we need when either choice seems flawed or contradictory. The next time you get that ego feeling (you know, superiority, judgment or even the ugly ones like righteousness and victimhood) – stop, and as Tolle would advise, become aware. Look with your heart, and feel the shift. I’ll be practicing along with you.